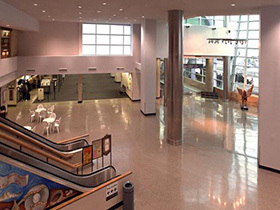 Concourse Renovation & Terminal Expansion - In 2004, we completed two separate projects for the Airport: a 75,000 square foot remodel and 88,000 square foot ground-up expansion. The renovation and expansion of the 75,000 square foot ticketing area, baggage claim, and central power plant was designed to handle an estimated eight million arriving and departing passengers. The expansion totaled 88,000 square feet, and included a new roadway and rental car complex. 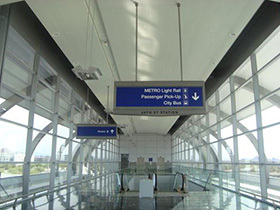 It was constructed in two separate phases to keep the terminal in complete operation 24 hours a day, seven days a week. Construction began in late 2008 for the LEED-certified Maintenance and Storage Facility and Stage 1 of the guideway installation. The guideway will travel from 44th St to the East Economy parking structure to Terminal 4. Expected to be complete by 2020, SkyTrain is planned to link to all airport terminals and the Rental Car Center. Using Bombardier APM 20 vehicles, this is the second installation in the United States for such models after the Skylink Automated People Mover at Dallas-Fort Worth International Airport, and the third installation worldwide following Terminal 5 at London-Heathrow International Airport. Bombardier Transportation selected Wilson Electric to provide Design-Build electrical construction services for Phase I of the project. Wilson Electric was awarded Phase IA in March 2013.